We receive “Signs” from those we love that have passed on often quite “out of the blue!” But their timing is ALWAYS Perfect. Sandy recently responded to one of my Posts on Facebook regarding seeing “Signs!” Sandy wanted to share this beautiful story with you Readers. Thank you Sandy! It really was lovely to receive and I hope will encourage other Reader’s to share their “Stories” also. Late 2017, Francesca “Franny” to her friends died suddenly at the age of 38! Franny was a friend and co-worker. NOTHING can prepare you for when the police come to your work to give you the news that someone you know has died. The disbelief and shock I was feeling when they were telling me what had happened was nothing compared to the physical pain I was feeling in my solar plexus. It honestly felt like I had been punched and it only intensified more after the police left, to the point I was bending over and groaning. Sounds dramatic but I guess that was my body’s response to the news I had just been given. As the months went by, I was still having a hard time getting my hard around it all…her death, how it happened and the fact she was gone. Every day, she was heavily on my mind…always popping into my head. I cried lots, talked to her lots, prayed for her and just…missed her! Was it a joke? Only a handful of people in our city knew her nickname! Needless to say, it was a mystery that brought much happiness to my boss and made her feel good. My boss, who is a firm dis-believer of the afterlife, for the first time ever, said “Maybe we do go somewhere after we die!” She had a look of wonder on her face and tears in her eyes! A month or so after that had happened, I, myself was going through a particular hard time with things and again, I was thinking heavily of Francesca. I was at work when I was called out the front by someone saying there was a man out the front with flowers! I went out there and Francesca’s best friend of 25 years was there and he was holding 3 brightly coloured Gerberas. I found out from him that he had a feeling in his gut to guy buy some flowers for me. He apologised for only being able to afford a couple because he was broke, but he just felt he must do this. 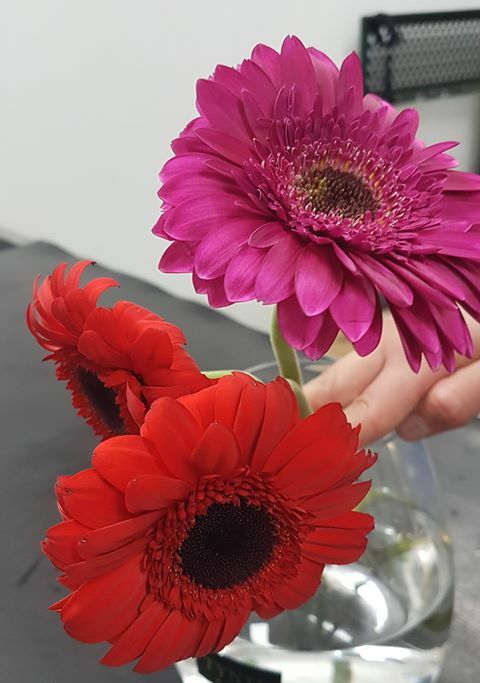 He also had no idea that Gerberas are one of my favourites. He said that he can still feel Francesca and that she does work through him. They had a very close relationship. He also said that it was him that had dropped the roses off for my boss the time before as again, he just felt that he had to. I let him know that it was amazing timing and I went onto explain how my boss had had a bad day that day and receiving the roses the next day had made everything better. Interestingly enough, a few weeks after I had received my flowers, I realised I wasn’t thinking so intently about Francesca anymore and I felt a little better about it all. I truly believe she sent these flowers to help both my boss and myself at a time when we both needed it and to help with my grief, to give me closure. This story is dedicated to “Francesca” and “Gerberas” everywhere! I am sure my Followers will resonate with and love your story.